The last several months have seen really rough natural events all over the world -- earthquakes, tornadoes, volcanic eruptions, flooding, and hurricanes. Here in Arizona, we have all-time high temperatures of 117 degrees (today) and major dust storms that paralyze highways and cities. 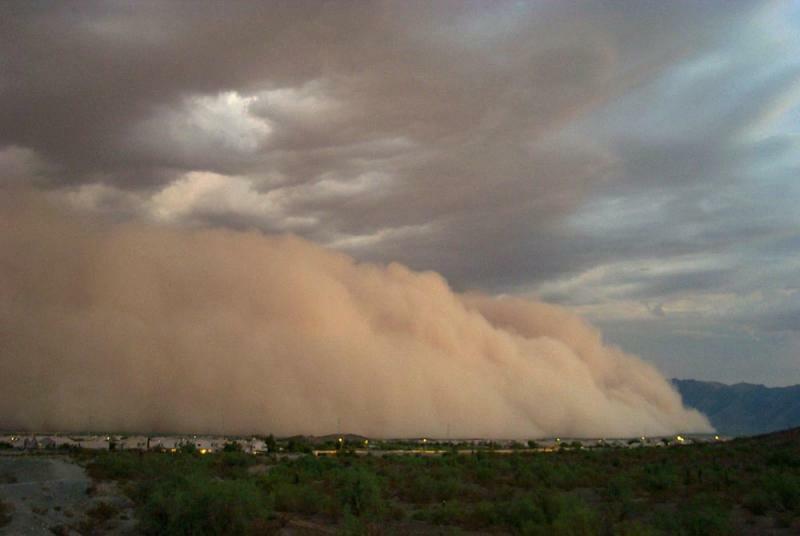 The proper name for these storms, which occur naturally in the Sonoran and Saharan Deserts, is "haboob". It comes from an Arabic term meaning "strong wind." Unfortunately, using this word also stirs hornets' nests in certain Arizonans -- who insist that we don't have anything like those storms they have in the Middle East. Thankfully there are also those who recognize that we're citizens of the world, linked even by the type of storms we have. David Wilson of Goodyear AZ wrote: "according to his [Yonts, above] logic, the following words of foreign origin should also not be used as they may insult him and our armed forces? Typhoon, shawl, pajamas, and kiosk. Also, we should not teach "algebra," use the "zero" or wear "khaki" pants." Ho'oponopono is a process that honors our connections, even those to which we are blind. There is both shared responsibility and shared benefit in it. We are united in the memories which materialize in our lives as "problems" . . . and we have no idea who also may be sharing these. Count on it, though: whoever shows up in our lives, is one of these people. And count on it also: whatever we clean in ourselves, comes off of everyone else too. That's the shared benefit. The first time I saw Dr. Ihaleakala Hew Len after my initial Ho'oponopono training, he said to me, "Ah, you're giving me another chance." At first I didn't understand what he meant. Then he taught me this notion that people who keep showing up are giving us another chance to make amends. I felt bad, thinking maybe I was bugging him -- bringing back old "stuff" that I didn't even know I carried with me. I feel great love for this man; I don't mean to make anything worse for him! But then he said this is the perfect thing to do, a good kind of "bugging," if it's bugging at all. My showing up allows him to do his cleaning -- and me to do mine. So I could see from my behavior [attending so very many Ho'oponopono trainings!] that I must have an awful lot of cleaning to do. Being a doctor, I have a lot of people to clean with also. Lord knows what kind of karma I'm carrying. It seems no accident at all that haboobs happen in the Middle East as well as deserts here in Arizona. For sure we share memories, and now blood. Some of my patients are Muslim, and they are fasting for the holy month of Ramadan. I thank them for the cleaning they're doing, in their own way. I saw something today on the news that tore at my heart: a hospital in Tripoli, Libya where patients had been abandoned amidst chaos. It was all about clashes between rebel forces and those still loyal to Moammar Gadhafi. Piles of bodies left behind, some still living . . . in pain, needing care. Doctors shot, still in their scrubs -- bodies dumped in a canal. Nobody knows who did the killing. One of my colleagues is in Libya, with the International Medical Corps. I can only imagine what he's seeing, the situations he's dealing with, and the many people he's assisting. Most likely, he's feeling like he can never do enough. He is very brave, and I am grateful to him. I'm cleaning. Truly, we are all connected.